With power, unfortunately, comes complexity and to program the Stream Byter requires familiarity with the MIDI protocol at a byte level. This guide will attempt to explain in detail how rules are constructed and also provide some recipes for some of these 'interesting' transformations. If you are not ready to write your own rules, then fear not, as we can write rules for you which can be copied from an email and pasted into the Stream Byter. 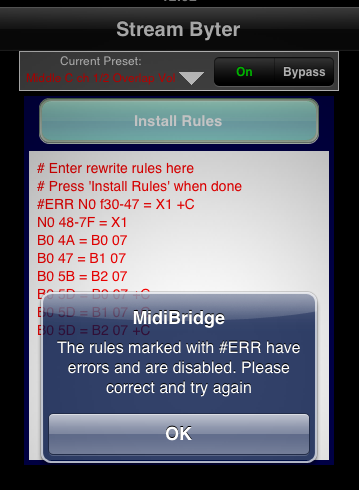 If there is something you are trying to do, why not post your requirements to our soapbox forum and we or other MidiBridge users will try and construct suitable rules for you to configure your copy of MidiBridge with. An editable text area is where you paste/edit your rules for events passing through the port on which it is configured. You get to this page by touching the 'beaker' button on the port where you want the transformations to occur. You'll notice the rule in error has been commented out and prefixed with 'ERR'. 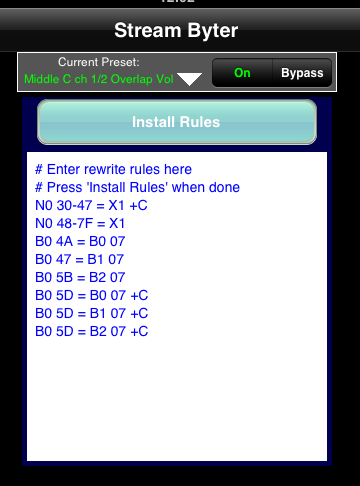 To fix a rule, correct it and press 'Install Rules' again. If a rule was marked with '#ERR' and you correct it, there is no need to remove the '#ERR' part yourself, as the rule checker knows this is a correction and will remove the '#ERR' for you before checking the rule again. If all your rules are valid, then the edit area text will appear in blue and the rules are now active. Do remember to save your rules into a preset so that you can recall your ruleset on other ports too. That is how you enter rules, now lets look at how to create them. On the left of the equal sign is where you specify what to look for on an incoming message in order to apply the transformation to the message as specified in the output clause. Essentially, if an incoming message matches the input clause, then the output clause is applied to it. The exception to this evaluation order is when rules have optional flags set, but we will look at that later. You can specify a range using the minus sign surrounded by the low and high values, eg 4-6 means values 4 through 6 inclusive. +C - clone the message before rewriting. This creates a new copy of the message and applies the output clause to it and schedules it for routing after the original event. The original event is left untouched. Note that the cloned message is passed through all the modules that the original message passes through. In order to prevent infinite loops, the Stream Byter will skip any rule that has the +C flag set when processing a cloned message. +B - block the message. The message is immediately blocked and the message is not routed nor passed through any further Stream Byter rules or other modules. Hopefully, this will get you going with the Stream Byter module. If you are having any issues with the Stream Byter, do please contact us or use our soapbox forum.